I have a story to tell about Black Tuesday. If you’re not into stories, feel free to scroll down for the review at the end. I won’t be offended. We found out about Black Tuesday from a Frenchman. I just got into craft beer in 2015, really, because of the fella. He was taking me out a lot, and we lived in Chicago, and we had a lot of fun trying to taste everything. I hadn’t really thought about how regional some of the craft breweries are, because I hadn’t yet started taking beercations, or trying to find things from the coasts while we were in the Midwest. Soooo…all of this is to say is that we didn’t get The Bruery much in Chicago. Sure, we found that we could get a lot of the bottles at Binny’s, but I never saw it on tap at Chicago bars, so we didn’t know what we were missing until Franck told us about The Bruery while we were visiting his beer bar in central France. The fella and I went on a trip to France in December 2016. It was a ton of fun, even though it was part work for me. I’d been all around France several times, because my mom was a French teacher and I got to accompany her on several student trips while I was growing up. It was so much fun to show the fella around the country that made me fall in love with exploring. On our previous 2016 trips to Europe—Greece in May and Amsterdam in June—there had been plenty of beer. Especially in Amsterdam, where we drank a lot of Dutch beer, but also allllllll the glorious Belgians. We had (erroneously) assumed that Belgian beer would be all over the place in France. It was not. In France, they have Kronenbourg and Heineken, and sometimes a few other things, but not much of a craft beer scene, even for imports from their Belgian neighbours. I enjoy wine, especially French wine, but French wine always makes me want champagne, and champagne is cheaper in France than in the U.S., but it still isn’t cheap. At least the good stuff isn’t. Our wallets and our tastebuds needed beer. And then I found Le Gambrinus on Google Maps. We took a train from Paris to Tours, and we were going to do a combination castle-and-wine tour the next day, but on the night we arrived, we just wanted some beer. I typed “beer” into Google Maps and found Le Gambrinus, less than a mile from our hotel. I told the fella that it was a risk, but there might be an acceptable beer bar in Tours. Franck was manning the bar when we entered Le Gambrinus, combination bottle shop and beer bar, specializing in Belgians. It felt like home, and Franck was amazing. I have about six years of French language study behind me, but it ended over a decade ago, so my French is pretty rusty. Franck was more charming than everyone in Paris combined, when it came to making the effort to understand me and encouraging me to practice. His English wasn’t perfect, so he decided that he would speak English when talking to the fella, and always French to me. He patiently said the same thing twice many times, and made us feel so welcome, like we were at our own neighbourhood bar at home. We tasted so many beers, and chatted about our favourites on both sides of the Atlantic. Le Gambrinus even carried some American beers; I specifically remember Brooklyn Brewery. Franck said that IPAs took too long to ship and they often came to Europe tasting stale, but he liked many of the other American craft beers that he could get. Anyway, Franck was flabbergasted that we didn’t know about The Bruery. I find that the French often underestimate how wide the United States is, and just how much land is between New York and California. He talked up The Bruery so much, and we promised to try everything we could from them once we got home. He said that they had an amazing, intense beer called Black Tuesday. We said we’d track it down and send it to him. 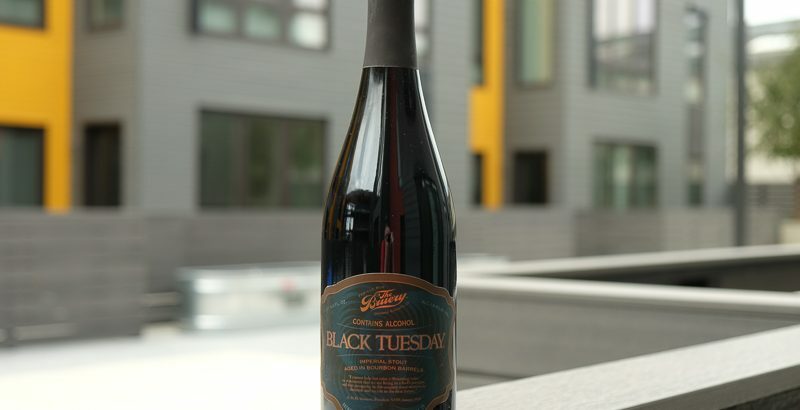 It was only once we got home that we realized how difficult it is to get a bottle of Black Tuesday when you live in the Midwest. For those not familiar, Black Tuesday releases once a year on a Tuesday in November. Each “regular” buyer at The Bruery is limited to six bottles; members can get a couple extra. But they don’t ship outside of California, so we were out of luck last year. And then we moved to California. 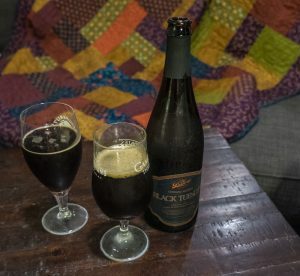 So this year, I ordered my allowed six bottles and hoped that Franck and everyone else were right; that Black Tuesday is the legitest of legit and rivals Bourbon County Stout for rich boozy fantasticness. We opened our first bottle on Black Wednesday, the day before Thanksgiving. It was delicious—rich, chocolate, boozy, a bit syrupy, which is to be expected for a 19.5% brew. It wasn’t too sharp, though, pretty smooth for the alcohol content and—I hope this doesn’t make us sound like alcoholics—easy to drink the whole 750ml bottle. Franck, we’re saving one for you! Nous espérons que nous pouvons aller en France cet année, nous voudrions t’amener votre bouteille!